I've been a big fan of the Optimum Nutrition Amino Energy Grape and have been using it pre workout for the past 6 months. It gives me that little 'kick' before and during my workout and loved the grape taste. But ofcourse, I'm always open to new taste sensations so when Cytomax sent me a little goodie bag of supplements to try, my body and tastebuds were more than willing to give them a go. The Monster Pump Sour Grape mixed well in the bottle. Be careful when you're mixing though as pressure does build up in the bottle due to the sodium bicarbonate that's in the formula. When I openend the bottle, some of the drink nearly spilt on me! so best to mix it gently at first and maybe have the lid slightly opened when mixing. I had the drink about 20min before training and it tasted great. Tasted slightly more efferscent than the amino energy purely because of the bicarbonate but tastewise, it tasted pretty much the same. So that's a good thing! 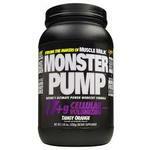 Per serving the Monster Pump has 25g carbs (4g) sugar and 100cals vs Amino Energy which has 2g carbs and 10cals. The extra carbs in the Monster Pump comes from dextrose and maltodextrin but these quantities are not significant to make that much dent in your diet if your goal is for energy during training. Both the Monster Pump and Amino Energy contain the essential BCAAs, Amino Acids and Glutamine to help with recovery. While the Monster Pump does have a little kick via the 'Monster Focus' complex, I didn't feel it as much compared to the Amino Energy blend. But if we're measuring the energy itself that was felt by these 2 products then I would say they are very similar. About 30mins into the workout, I started to have a second wind and felt like I had the energy to put more weight on whatever exercise I was doing to continue. By the end of the workout I had a good pump and even 2-3 hours post workout I still felt a buzz through my body. Which hopefully means muscle building! In the end, like any product it comes to personal preference of how you want to feel. Yes I have tried Superpump but that went way to my head and I got a headache. The energy was great though but I'd rather be in a calmer state to train but still with a little kick - not alot like Superpump. But if you love that, go for it. If you want to try a pre workout drink and have some extra energy for your workout with the added benefits of Amino Acids for post workout recovery, then Monster Pump or the Amino Energy will do the trick. Just up to you how much kick you want!